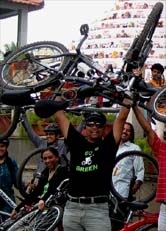 GoGreen-19Jul09 - GGI-Group size: 4000+ Professionals, Increasing on day to day basis, Come & join us 2 serve Mother Nature. This Sunday we rode towards MG road. 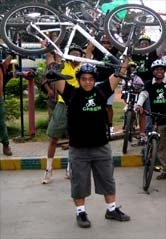 Timmanna bhat, Vishal, Anup, Kiran, and Sumit participated in the ride. 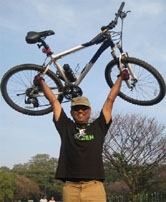 The route that we rode is Jayanagar, Lalbhagh west gate, J C road, Corporation, Kasthuraba Road, MG road, Brigade road, Shoole circle, Richmond road, double road, Lalbhagh east gate, Ashoka pillar Jayanagar and back to J P Nagar. On our way back, on Double road, we met Vsanth kumar and his friend. They well appreciated our T Shirt and enquired about our group. He said he is also a bike rider.